This 1946 CJ2A is as good as Gold! 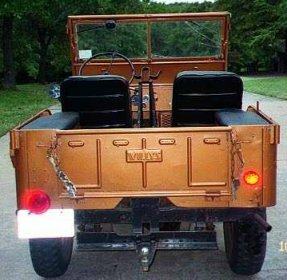 "Our Jeep is a 1946 CJ-2A, serial number #23247. 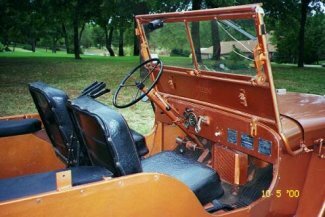 It is one of the early model CJ-2As that came with a column shift. The odometer reads 58, 900 miles and everything seems very tight and lacks the "looseness" you would expect from an unrestored 54 year old vehicle! The body has a little rust on the right side behind the spare tire mount and below the right door opening. The right side floor has a couple of rusted places that appear to have been caused by the wood reinforcements inside the metal braces." 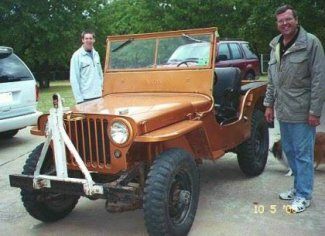 "We found the little jeep advertised in the local Oklahoma City paper. I was interested to see it because I had a 1946 CJ-2A (which was in fairly poor shape) when I was 16 years old back in 1970. I was expecting this one to be in equally poor shape, too. When the owner took us out to his barn to show the jeep to us, I couldn't believe my eyes, it was in such good shape! The guy that was selling it had only owned it a few months, but the man he had bought it from had owned it for about 20 years, and had only used it for hunting. Each year he would put it on a trailer and take it to Montana for a couple of weeks of hunting. The man had put new seat covers on it and had it painted (a non-original gold color) I called the previous owner myself and he said the 58,900 miles on the odometer was the original mileage! He had purchased it from an "egg" company in Denver who he thought had bought it new. I plan to restore it to original colors and hopefully do a frame up restoration at some point. The engine purrs like a kitten and everything works great. Some of the seals are starting to leak, so will replace those as necessary. The bottom of the radiator has some bad corrosion, so I'll probably get a reproduction replacement for it." "The ancient NDT tires are so old the Firestone ones say "Gum Dipped" on them, so will probably get some new McCready or Coker 6:00 or 7:00-16s. It has 7:00-16s on it now which I understand was an optional size. The NDTs are REALLY poor in the snow, (we had quite a bit this year and I had to chain up the front tires just to climb up our steep driveway), so I may consider getting a set of NDTs for "show" and set of 15" wheels and modern snow tires for "go". I also had to put a new Best Top on it so I could stand to drive it this winter. The top is great, but not exactly like the original ones. For now it is just a joy to take the jeep out for short drives to breakfast on Saturday morning and imagine what it was like back when the jeep was new! Happy Trails!"